Wow, this was delicious!! 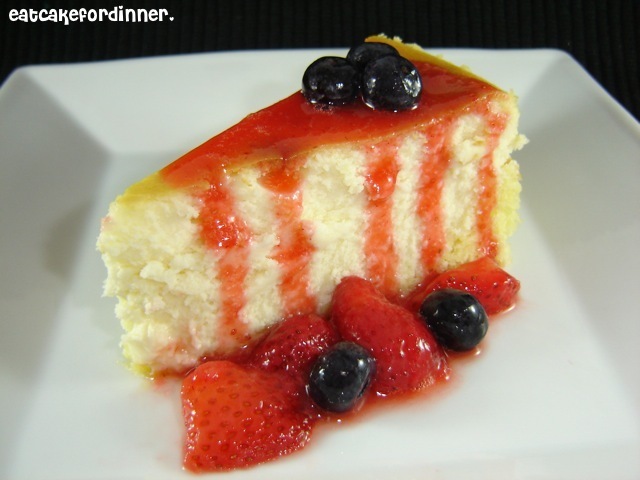 This is very close to the perfect cheesecake, in my opinion. I must admit I haven't eaten a lot of cheesecake. Why? Two reasons, the first being I am an "impulse baker", meaning I crave something and I jump up and make it. Cheesecake doesn't really fit into my lifestyle. It takes planning and patience. The majority of recipes require the cheesecake to sit in the fridge over night. By the next day, I have probably already moved on to a different dessert. Reason #2 is because I can't let myself buy a piece of cheesecake for $5 or so at a restaurant when I think I could make a million cupcakes for that price. Anyway, I finally made a cheesecake. Mainly because I had four sticks of cream cheese that were expiring, so if I was ever going to make a cheesecake, now would be the time. I'm sure all of you have heard of the famous Junior's Cheesecake in New York (unless your Mark of course - Ha Ha)! 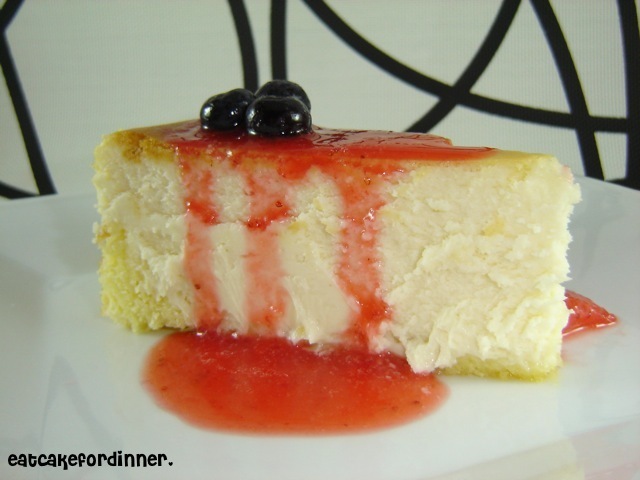 One of the owner's shared their famous cheesecake recipe and that is the one I tried. I loved so many things about this recipe. I loved that the "crust" was actually a light lemon flavored sponge cake instead of the usual graham cracker crust. I love lemon and I love cake, so we were off to a great start. Next, is the filling, it is rich and creamy and oh so delicious. Last, is the topping. I actually like my cheesecake plain, but I know not everyone does. So, I topped with some yummy strawberry sauce with strawberries and blueberries on the side. This cheesecake was really really really good. It is definitely worth the long wait and the patience it requires! It bakes up beautifully and it stays fresh for several days. Preheat oven to 350 degrees. Generously butter a 9-inch springform pan and wrap tightly with foil, covering the bottom and extending up the sides; set aside. Sift the cake flour, baking powder and salt together in a medium-sized bowl and set aside. Beat the egg yolks together in a large bowl with an electric mixer on high for 3 minutes. Then, with the mixer still running, gradually add 1/2 cup of sugar and continue beating until thick light-yellow ribbons form in the bowl, about 5 minutes more. Beat in the vanilla and lemon extracts. Sift the flour mixture over the batter and stir it in by hand until no more white flecks appear. Then, blend in the butter. In a clean bowl, using clean dry beaters, beat the egg whites and cream of tartar together on high until frothy. Gradually add the remaining 2 Tbl. sugar and continue beating until stiff peaks form. Stir about 1/3 cup of the whites into the batter, then gently fold in the remaining whites (don't worry if a few white specks remain). Gently spoon the batter into the pan. Bake the cake just until the center of the cake springs back when lightly touched, only about 10 minutes (watch carefully). Let the cake cool in the pan on a wire rack while you continue making the cheesecake filling. Do not remove the cake from the pan. Place an 8 oz. package of cream cheese, 1/3 cup sugar and the cornstarch in a large bowl. Beat with an electric mixer on low until creamy, about 3 minutes, scraping the bowl occasionally. Beat in the remaining 3 packages of cream cheese. Increase the mixer speed to high and beat in the remaining 1 1/3 cups of sugar, then beat in the vanilla. Blend in the eggs, one at a time, beating the batter well after adding each one. Blend in the heavy cream. At this point, mix the filling only until completely blended (just like they do at Junior's). Be careful not to over mix the batter. Gently spoon the cheese filling on top of the baked sponge cake layer (I didn't add all the filling, because I was afraid it would overflow. I did all but maybe 3/4 -1 cup). Place the springform pan in a large shallow pan containing hot water that comes about 1-inch up the sides of the pan. Bake the cheesecake at 350 degrees until the center barely jiggles when you shake the pan, about 1 hour and 10 minutes. Cool the cake on a wire rack for 1 hour. Then, cover the cake with plastic wrap and refrigerate until it is completely cold, at least 4 hours or overnight. Remove the sides of the springform pan. Slide the cake off the bottom of the pan onto a serving plate. Or, if you wish, simply leave the cake on the removable bottom of the plan and place it on a serving plate. Top with desired toppings. If any cake is left over, cover it with plastic wrap and store in the refrigerator. I am not usually one for cheesecake because I find it a little too dense but this looks creamy and fluffy at the same time. i love your blog. everything looks delicious. could go for a slice, or two, or three of this right now. 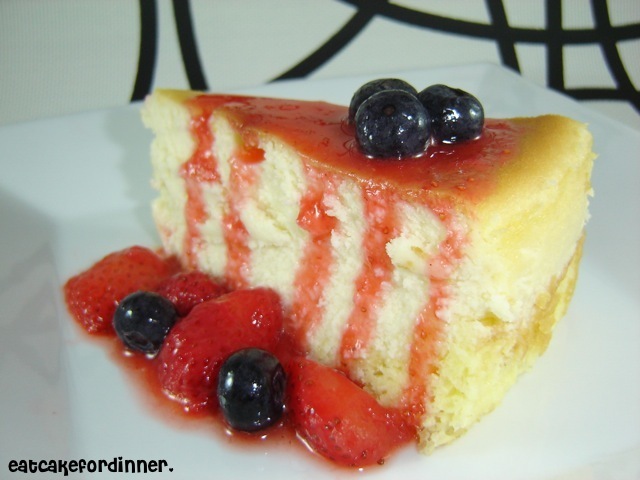 Your cheesecake looks very tempting with the berries and the juice drizzling down the sides into a perfect little puddle that begs to be scooped up in a few big bites. Yay! Thanks so much for sharing this, I can't wait to try it!